Since the mid-nineteenth century, the United States has used sport as a vehicle for spreading its influence and extending its power, especially in the Western Hemisphere and around the Pacific Rim, but also in every corner of the rest of the world. Through modern sport in general, and through American pastimes such as baseball, basketball and the American variant of football in particular, the U.S. has sought to Americanize the globe’s masses in a long series of both domestic and foreign campaigns. Sport played roles in American programs of cultural, economic, and political expansion. Sport also contributed to American efforts to assimilate immigrant populations. Even in American games such as baseball and football, sport has also served as an agent of resistance to American imperial designs among the nations of the Western hemisphere and the Pacific Rim. As the twenty-first century begins, sport continues to shape American visions of a global empire as well as framing resistance to American imperial designs. 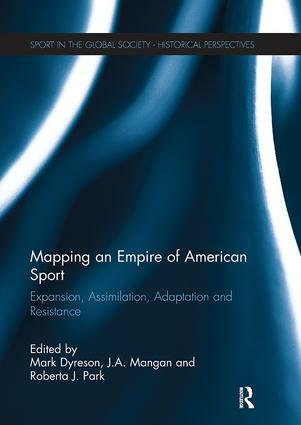 Mapping an Empire of American Sport chronicles the dynamic tensions in the role of sport as an element in both the expansion of and the resistance to American power, and in sport’s dual role as an instrument for assimilation and adaptation.